The principal topics involved in Fatigue and Damage Tolerance assessments based on FEM are discussed. The seminary opens (Introduction) with a short description of what a fatigue failure is and what are the main design criteria against fatigue (Safe Life, Fail Safe, Damage Tolerance). 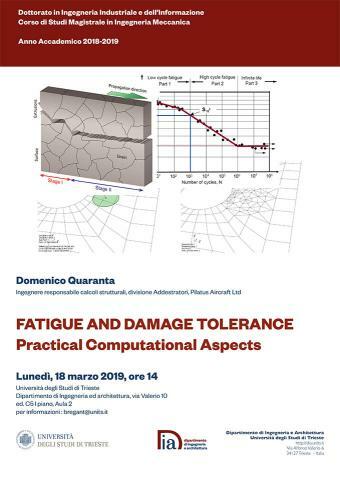 The Uniaxial fatigue analysis, crack initiation, process is described, highlighting the main ‘actors’: stress concentration and notch factors, rainflow counting, cumulative damage, stress based and strain based approaches (S-N and e-N curves). The Neuber and Glinka’s Equivalent Strain Energy Density methods are shown for the calculation of the elastic-plastic stress-strains. The principal sequence effects induced by plasticity are shown. The central part of the seminary provides an insight of the main challenges involved in a FEM assisted fatigue analysis, typically in multiaxial regime, are introduced. An overview on most commonly used approaches and parameters is given. A description of the principal issues involved in Cyclic Plasticity are described. In particular the Critical Plane approaches with fatigue parameters of Brown-Miller, Fatemi-Socie, Smith-Watson-Topper are described, with elastic-plastic stress tesnor sequence derived with the Pseudo-Material approach of Köttgen-Barkey-Socie, in combination with the Mroz-Garud Multi-Yield Surface cyclic plasticity model. Finally the fracture mechanics and crack growth aspects are discussed. The concepts of Linear Elastic Fracture Mechanics are deployed and Stress Intensity Factors are introduced. Some of the methods to calculate SIFs from FEM, with their own pro and cons, are shown (emphasis on J-Integral and quarter point FEM elements). Crack growth models (Paris, Walker, Nasgro) are shown and the algorithm to calculate crack growth life curve is briefly discussed. Some basic topics on crack closure and retardation effects are shown.